The Monday Mosaic is taking a little autumn vacation this week, but will return in full force next week so stay tuned! Today Boston Handmade is acknowledging a change of season for artists, artisans, and crafters. We are making the big switcharoo from outdoor fairs to indoor holiday shows. We bid an exhausted farewell to pop-up tents and say hello to cheery offers of free gift wrapping. Stay tuned to the blog this week for some recent show reviews and upcoming show previews in addition to our usual array of eclectic topics about creativity. October 28th was the last South End Open Market of the 2007 season. The SEOM is an upscale artisan market - the only market of its kind in Boston - and runs from May through October each year in the South End neighborhood of Boston. The show on the 28th was also host to the annual SEOM costume contest and brought out some of the regular Boston Handmade members as well as a guest star from the Etsy Mothership. "This is past season was my second year at the market, and my first year as market manager. As market manager I run the market each weekend as it is happening. Chris, the market director, does the behind-the-scenes planning, networking and scheduling. 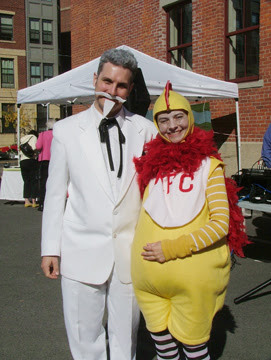 I'm the one that juggles vendors and assigns them to their booths when they arrive, fields questions from vendors and visitors, keeps the market running smoothly during the day, and yes, cleans up the whole thing after everyone leaves--even if I happen to be dressed like a chicken at the time!" 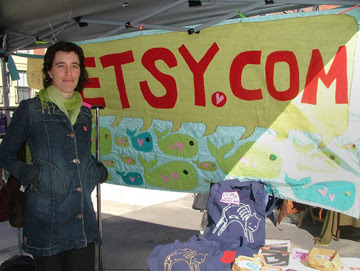 In addition to these responsibilities, Katy schedules and coordinates the two booths that the market donates each week to new Etsy sellers, "I enjoy scheduling the Etsy sellers because I remember what it was like to be a new vendor and have a lot of questions... and how exciting it is the first time you do an outdoor show." WonderAmy came for a visit during this last market as a representative from Etsy and she manned an Etsy booth and spread the word of the joys of buying and selling handmade. Amy also shared news of the new on-line Handmade Pledge that is sweeping the nation! 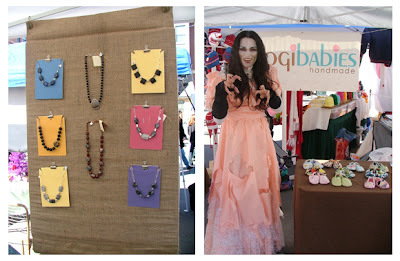 Other Boston Handmade members making an appearance at the last market were Stonehouse Studio and Pogibabies Handmade. Of the South End Open Market Katy says, "The best thing about all of it is that I get to meet lots of cool new creative people every week, in one place, that I wouldn't have the opportunity to meet otherwise. It's an adventure every week, for sure, with so many people and so many personalities!" And I think we can all concur. See you at the market next season!